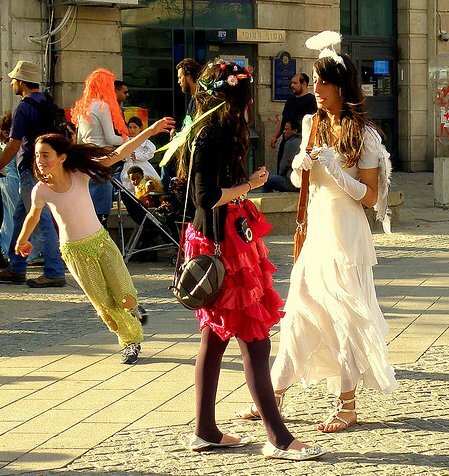 ©Flavio Is it the kids who like to be dressed up for Purim or the mommies who like to dress up their kids? One can still buy "oznei haman" in the supermarkets in Israel and so I thought that: 'Well, Purim may be over by now but one cannot have a blog about Israel without talking about Purim! "Oznei haman" (Haman's ears) by the way are special triangular shaped cookies that is eaten during Purim. © Ron Almog Old and young, big and small like to dress up during Purim. During Purim the Jewish people celebrate the fact that the Jews of the Persian empire were not slaughtered, as the evil Haman had planned to do. His plot was foiled by queen Esther who had the courage to approach the king to tell him about Haman's plans. Anybody who came into the king's presence without being summoned first could be put to death. (The previous queen, Vashti, was killed because she refused to appear before the king and his drunken friends). The king however welcomed Esther, listened to her story and the Jews were saved. Purim is celebrated in Israel by dressing up in costumes, eating oznei haman and giving friends and neighbours gift baskets filled with treats. The book of Eshter in the bible are read in synagogues. Every time the name Haman is mentioned during the reading, the children get to swing a noise maker to drown out his name. 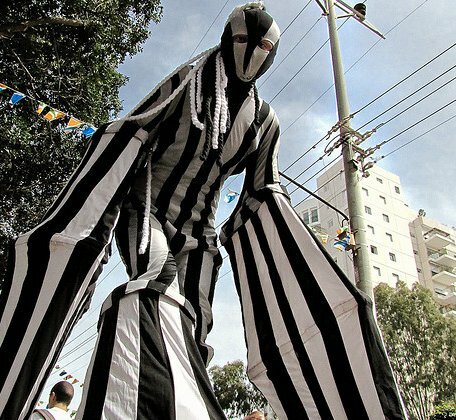 © Flavio A cool outfit in a Purim parade. 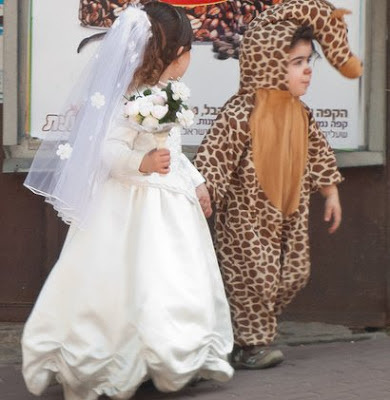 Many towns have a Purim parade and the children have a few days of from school. Purim is often described as the Jewish carnival or Mardi Grass. The word Purim by the way comes from the word 'lots'. Haman threw lots so see on which day the Jews should be slaughtered. It turned out to be on the 14th of Adar (around mid-March). Just think how terrified everybody must have been to learn that they will be slaughtered on a specific date. And how great the relief and joy when they learned that they are going to live! Now isn't that a good reason to have a party? Even after so many generations :). Get my blog posts in your e-mail folder by filling in the "Follow By Email" box at the top-right corner. I promise to never-ever send you spam.